Don't ask: Why is Carlos Garcia wearing that, erm, thing around his head? A) Out of sympathy for his dog, Cheesestick, who was wearing a cone after getting fixed. B) To keep himself from gnawing at his nethers, because he also just got fixed. C) To cover up a giant hickey on his neck. Because this is much less embarrassing. D) He was modeling his latest fashion idea, the SuperTurtleneck. E) To block out the constant booing of the fans. Believe it or not? Ripley once flew away during a game thanks to his hair wings. Believe it or not? 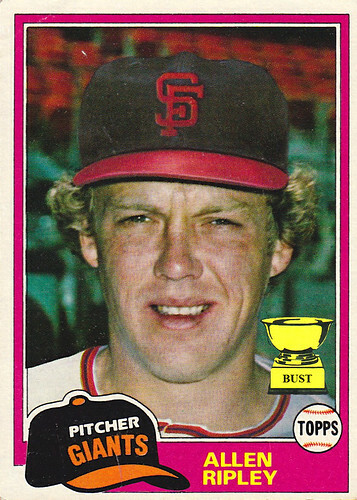 Ripley was really wearing a Giants hat in this photo; it wasn't a crudely drawn facsimile added during the card production process. Believe it or not? Ripley was a close talker, hence the closeness of his face to the camera lens. Believe it or not? Ripley's nose was detachable, as evidenced by the creases around his snoz. Believe it or not? 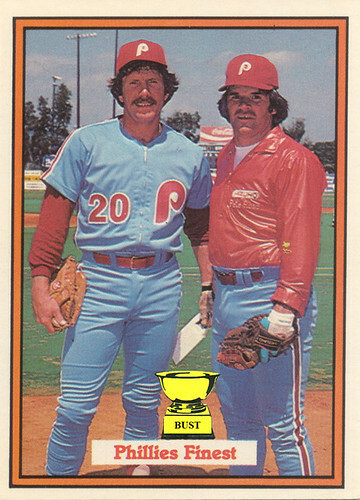 This card was not one of many abominations in the 1981 Topps set. Oh, in case you wondering, don't believe any of the garbage above. 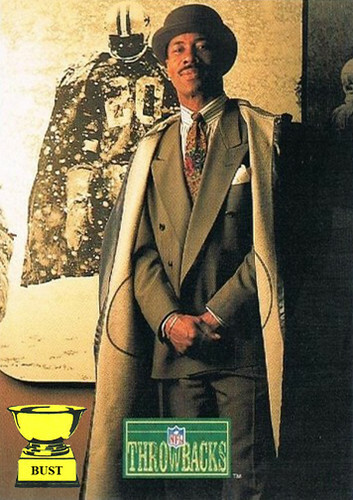 Time for a fancy-shmancy pop quiz: What's Lem Barney all dressed up for? Whoa, big boy: Hey there, Darrell. How you doing? That's an awfully big stick you're, ahem, carrying. You have it positioned so gracefully, so naturally. It's like — gulp — an extension of you. So, um, do you come here often? Huh-huh, not like that. Sorry, we're a bit flustered. You're just so bold, so — gulp — big. What's that? You don't want to brag? Well, you may speak softly, but you definitely carry a big stick. Doing anything after the game? Once, he put on a red-and-black-plaid flannel shirt; five minutes later, 42,000 trees voluntarily fell in the forest. Once, he shaved his beard at the request of a female fan; five minutes later, this photo was taken. 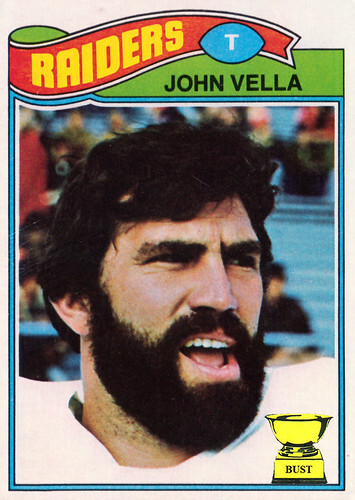 Once, he arm-wrestled a Kodiak bear; five minutes later, the NFL team in Chicago changed its name to the "Chicago John Vellas"
Once, he mistakenly walked into a Victoria's Secret store; five minutes later, everything on the shelves and racks had disappeared. Once, he was asked about his feelings after a game; five minutes later, he was still looking at the reporter, confused, wondering what these "feelings" were. Once, he walked into a maternity ward; five minutes later, all the babies were back inside their mothers and when they were born they came out with black beards. 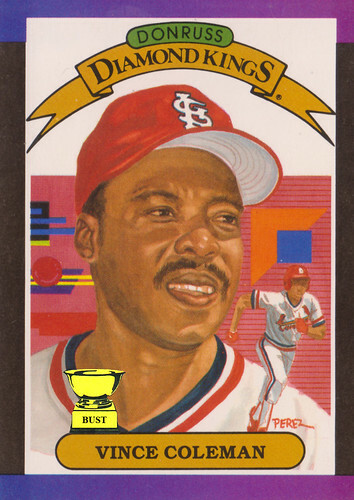 Outfielder with dentures, a wraparound 'stache and a penchant for playing "Rush"
What name could "grace" this card and better reflect the illustration? Whatever you say, Mr. Orosco: Um, hello there, sir. Has anyone ever told you that you're quite scary — and, of course, quite good-looking. And you're an awesome pitcher. The best we've ever seen. Yes, um, yes. 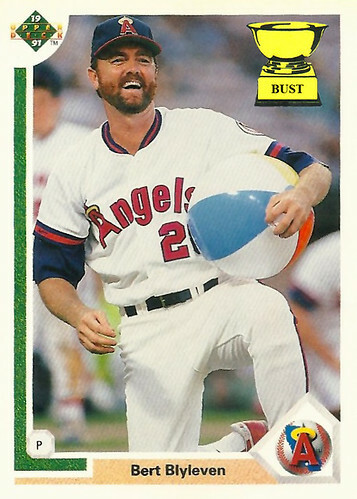 We would never think of making fun of you or your Diamond Kings baseball card because, um, what could we make fun of? We couldn't possibly find anything wrong with such a beautiful illustration or with such an attractive face. Just promise us you won't sneak through one of our windows at night and kill our families with baseball stirrups and a hacksaw. Also, in closing, let us just say that we love your bangs and hair wings, asymmetrical eyes, shadowy profile and translucent skin. They're beautiful attributes. What's that? ... Oh, this is actually a photo of Orosco's corpse. 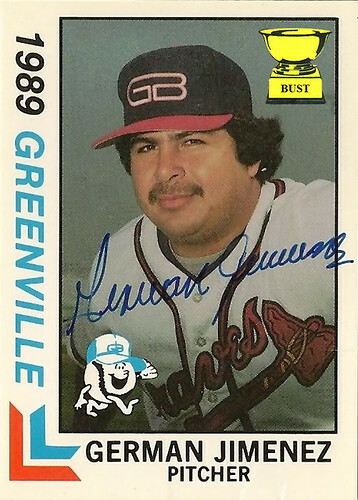 Well, in that case, this is one of the most frightening cards we've ever seen, and it would be better served in a gallery of serial-killer images than in a Diamond Kings set. 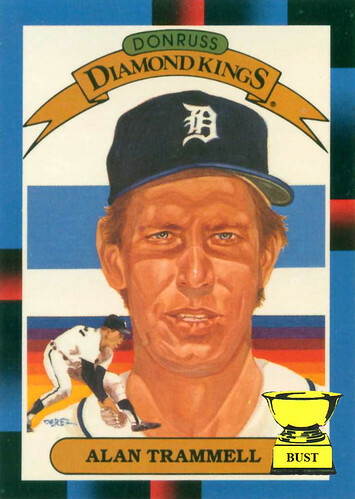 He's red-hot: Oh, man, did Donruss ever nail it here. 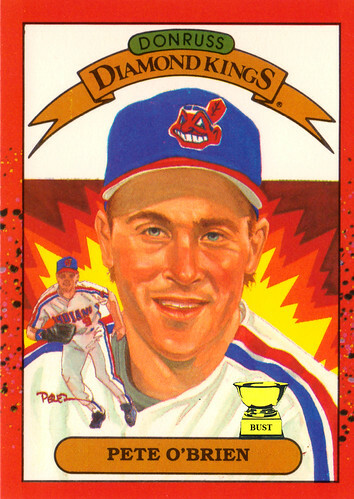 Pete O'Brien, ladies and gentlemen, was on fire in 1990. 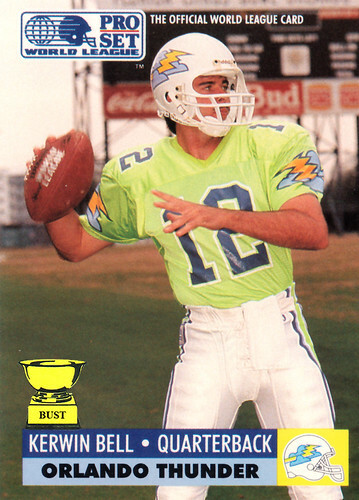 He was so hot, his mullet would spontaneously combust during games. He was so hot, he'd light his cigarettes with his finger. He was so hot, he'd boil water by swigging off a bottle, gurgling and spitting it into a pot. He was so hot, he would walk around with yellow, orange and red flames jumping off his back — strangely, with the colors never mixing and staying separate in straight lines. 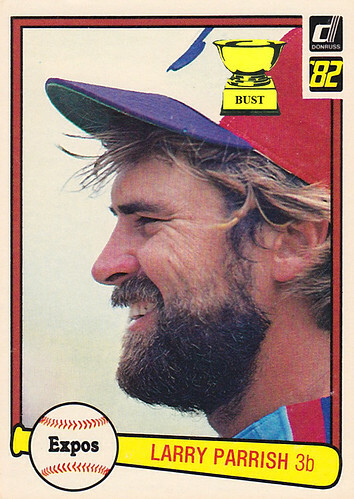 Pete O'Brien was so hot in 1990, he hit .224 with five homers and 27 RBIs. 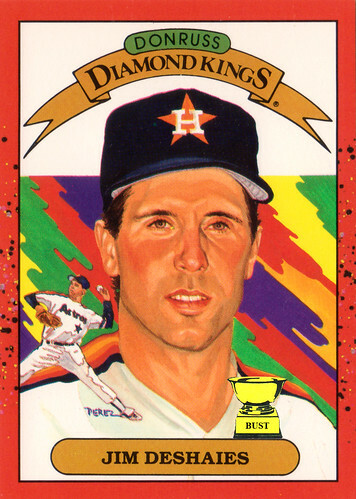 Nice work, Donruss. 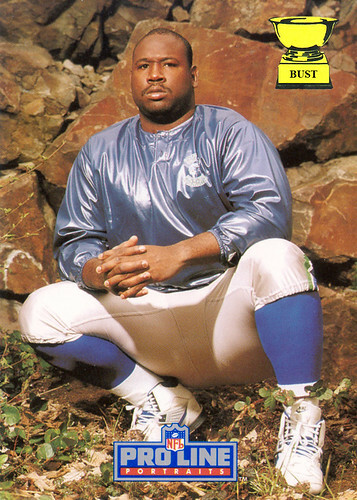 Cortez Kennedy: Um, what are we doing out here by these rocks? 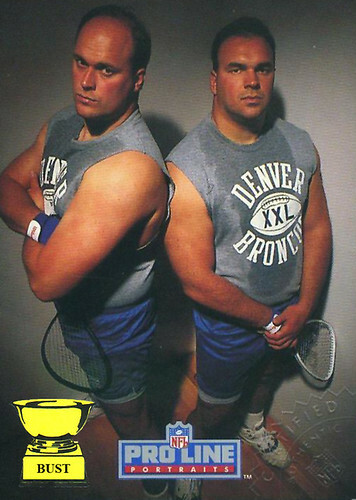 Pro Line photographer: We're shooting a football card, silly. CZ: What does this have to do with football? CZ: Is it because I'm strong, like a rock? CZ: Is it because our defensive line is like an avalanche headed toward the quarterback? CZ: Is it because football is such a grueling game, the best players, the ones who really succeed and prove themselves on the field and who strive to be the best, need to act like they've been carved from granite? PLP: Um ... actually, it's because it takes a lot of stones to appear on such a stupid card. CZ: Just take the friggin' picture. 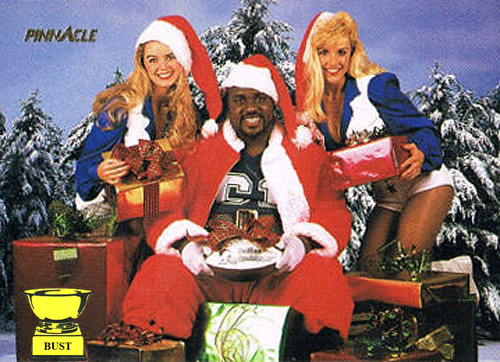 Jake Plummer was a Grade-A dork. Jake Plummer cut his own hair. Jake Plummer spent a lot of time on the ground, during games and otherwise. 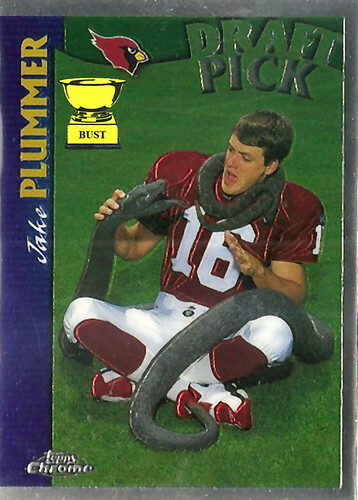 Jake Plummer should not have listened to the Topps photographer. 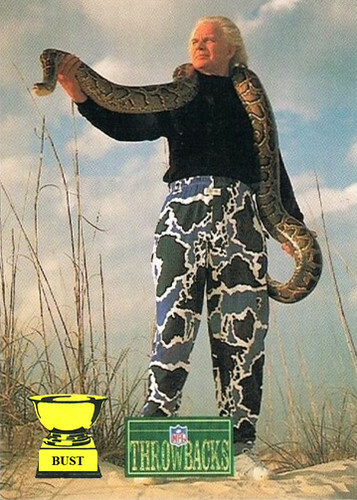 Jame Plummer liked to be asphyxiated while "petting his python." It hurts to be The Hawk: Oh, man. 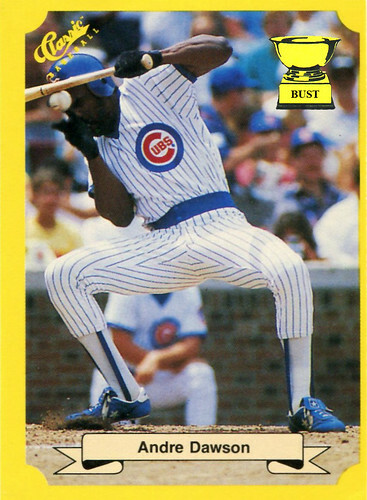 It's tough being Andre Dawson. 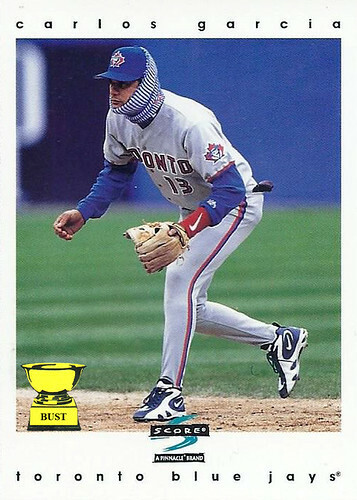 You had to start your career in French-speaking Montreal and you tore up your knees during your prime on artificial turf that was more like concrete than grass. 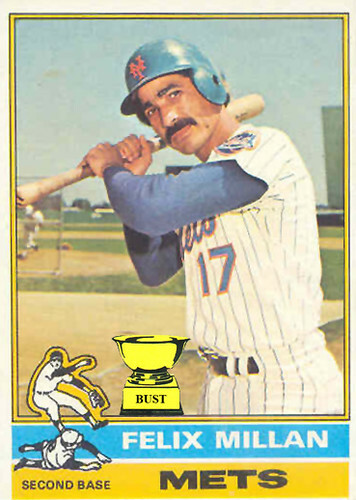 Then you went to the Chicago Cubs, who fielded laughable teams and continued the Curse of the Billy Goat when you should have been a star on the national scene. 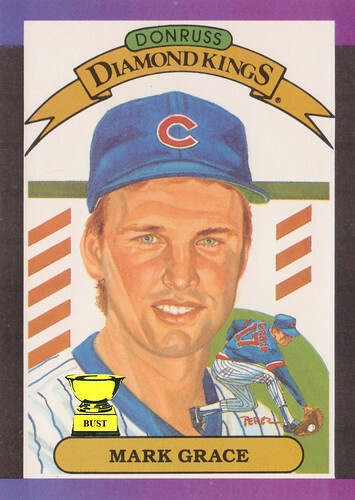 Somehow, you played through the pain in your knees and the pain of being a Cubbie and won an MVP award in 1987. 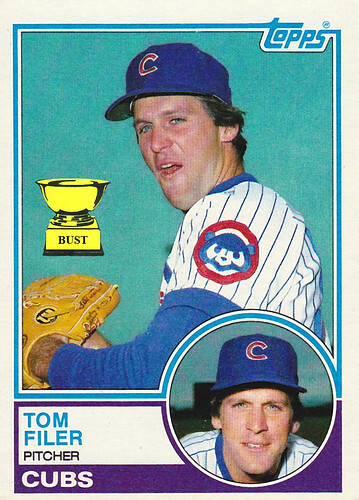 Yet, despite all that — and somehow looking like a pro athlete in those Little League Cubs uniforms — your 1987 Classic card features a photo taken at the moment you're getting plugged in the face with a fastball. Ouch. Maybe it's just us, but a Hall of Famer deserves a little more respect. 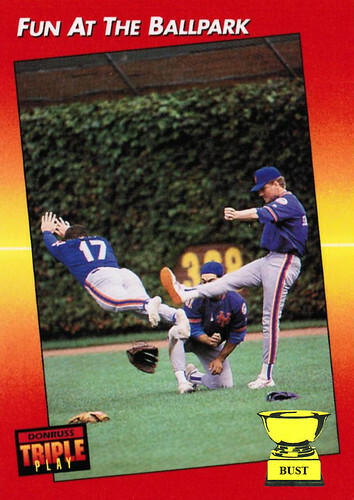 On the other hand, those are pretty weak break-dancing moves. 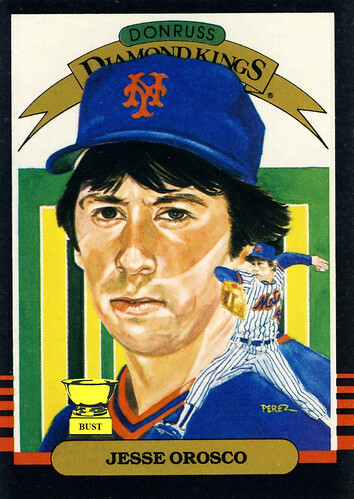 On a VHS case for his 1985 straight-to-video animal-buddy-cop movie, "Champ and the Chimp"
Try not to get choked up over this pop quiz: What is Felix Millan doing here? 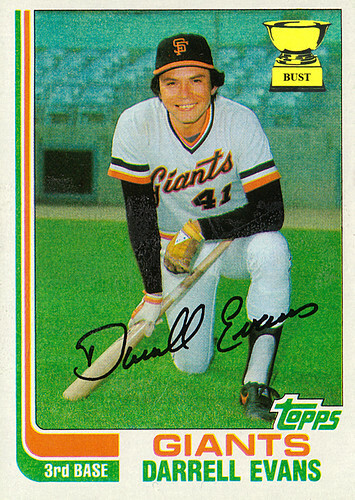 E) Making us jealous of his mustache, but not his unusual batting style. What a freak. The city of Cleveland lies on the shore of Lake Erie. Reggie Cleveland has passed out on the shore after drinking too many brewskis. The city of Cleveland once saw the Cuyahoga River light on fire. 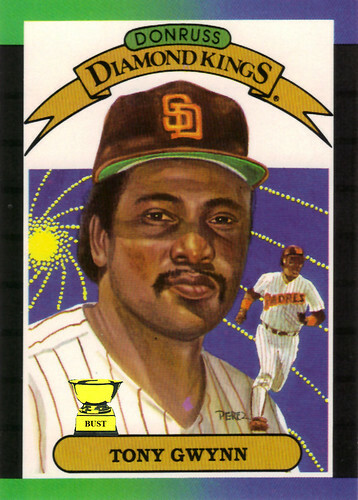 Reggie Cleveland once lit his own flatulence on fire. 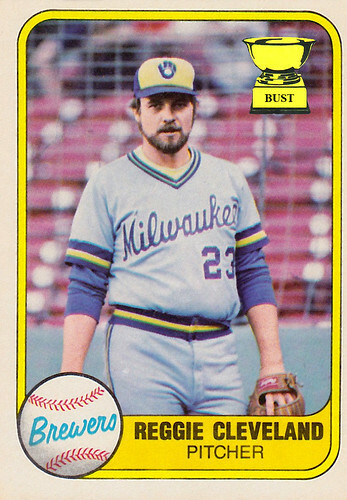 The city of Cleveland is the 45th-largest city in the U.S. Reggie Cleveland had the fourth- or fifth-largest beer gut among the Brewers. The city of Cleveland has been called "The Cleve." Reggie Cleveland has been called "The Creep." Summers in the city of Cleveland are hot and humid. So are Reggie Cleveland's armpits. The city of Cleveland is home to the Rock and Roll Hall of Fame. 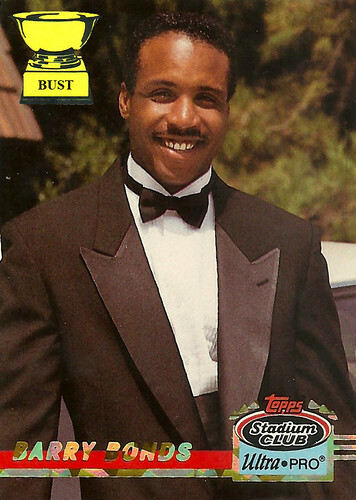 Reggie Cleveland has been to his share of KISS concerts, but will certainly never be in the Hall of Fame. Oh, lord, Rob. Run! It's starting to drizzle! 10) He'd try to dribble a ground ball after it was hit to him. 9) He'd set screens on the base paths. 8) He kept watching the clock. 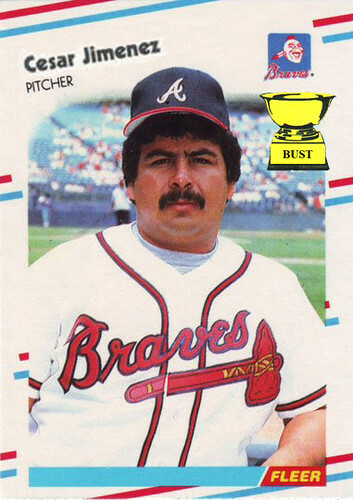 7) He'd play man-to-man defense in the outfield. 6) He'd sneakily paint all the balls orange. 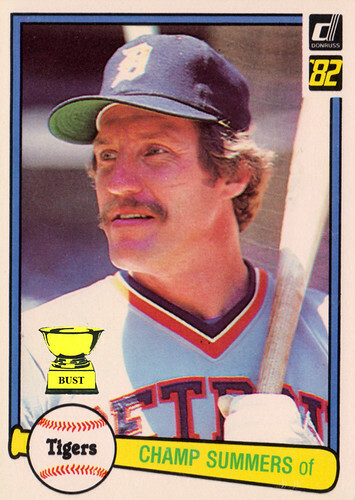 5) He'd catch a pitched ball with his bare hands when he was batting and chest-pass it to the guy in the on-deck circle. 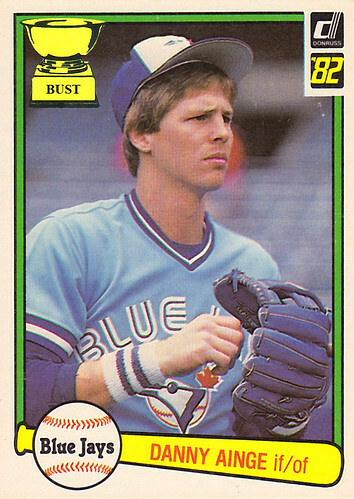 4) He kept crossing out "Blue Jays" on his jersey and writing "Celtics." 3) He made his jockstrap and cup out of a nylon net. 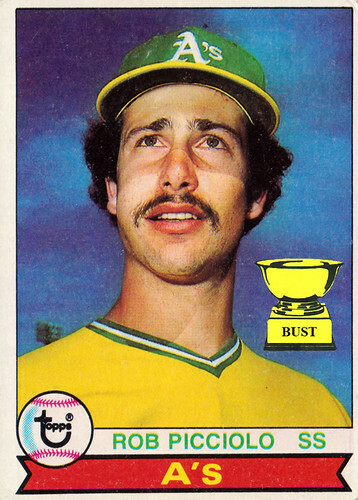 2) He made teammates nervous by talking about "hardwood." 1) He wouldn't take off his shorts. About me: What's up, ladies? I'm Big Chris and I'm ready to pump you up, if you know what I mean. Sure, I spend a lot of time in the weight room, but I also spend a lot of time in the bedroom. Wink, wink. Want to sweat it out and share a couple of protein shakes? You can find me at the gym in the locker room, if you're lucky.